In this week’s episode of Pulp Crazy, I celebrate what would have been Philip José Farmer’s 98th Birthday by discussing his tale of scholarship and sorcery at Miskatonic University. “The Freshman” is Farmer’s contribution to H. P. Lovecraft’s Cthulhu Mythos that follows an elderly frosh on his eventful first day at Miskatonic University. The short story was inspired by a dream Farmer had, where he was an elderly man rushing for a fraternity at a strange university. In this weeks episode I’m going to be discussing, The Bat Is My Brother by Robert Bloch. It first appeared in the November 1944 issue of Weird Tales. It’s been reprinted in a handful of vampire and weird fiction anthologies over the years, but I read it on unz.org. They have the original Weird Tales scan up for you to download and read. If you’re new to the pulps, but recognize the name, it’s most likely due to Robert Bloch being the writer of Psycho, the book that inspired the Alfred Hitchcock film of the same name. The story is most likely not in the public domain as Bloch passed away in 1994, but it’s there on unz.org if you’re interested. I’ll put a link to it and also a link to the isfdb bibliography in the show notes, in case you want to read the story online or purchase a used copy of one of the anthologies it appeared it. From what I saw I don’t believe this tale is currently in print, so the secondary anthology market is probably your best bet other than unz.org. The original issue of Weird Tales is probably a bit pricey, as most Weird Tales issues are. As you can probably guess from the title, and the image I chose for the episode title card, this is a vampire story. It’s about a guy named Graham Keene who wakes up in a paupers grave and busts through the cheap casket to emerge up out of the soil. After emerging he meets a vampire who informs Graham that he’s a vampire now too. 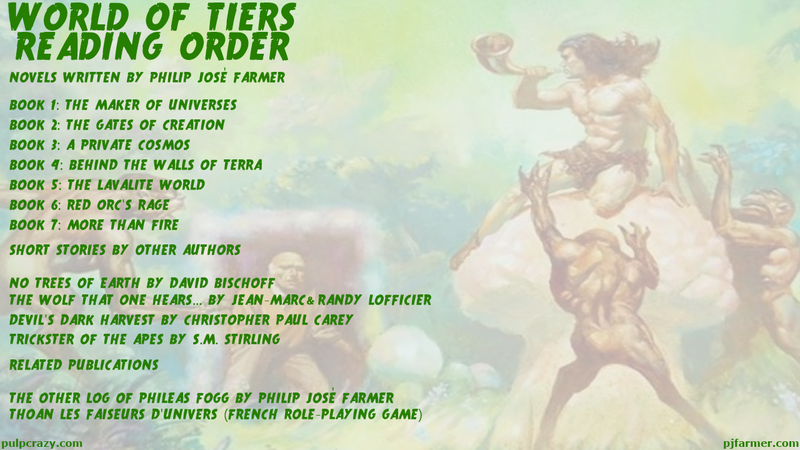 In this week episode I’m going to be discussing the World of Tiers series written by Philip José Farmer. I finished reading this series a few weeks back and I thought it would be a good time to do an episode on the series while it was still fresh in my memory. Besides the novels written by Philip José Farmer, I’ll also be discussing World of Tiers fiction written by other authors since Farmer passed away. I’m not going to be giving away any spoilers in this episode. I’m going to give you a nice idea of what the World of Tiers series is about, though. First I’ll start off with an overview and give some background information on the series. The theme of the series revolves around an advanced race of beings known as Lords. They are also called the Thoan, and Farmer refers to them early on as the Vaernirn. He abandons the term Vaernirn, though and sticks with calling them either Lords or Thoan in the rest of the books. In this episode I will just be calling them Lords to make it easier. The Lords are advanced beings who are human in appearance. However, they have at their fingertips vastly advanced technology. This includes immortality without aging past their prime, being able to construct artificial pocket universes, traveling between universes via gates, bio engineering, terraforming, gravity manipulation, the list goes on. It should be noted that within each Pocket Universe there is only one planet, but the planet can have orbiting satellites. In this weeks episode I discuss Yours Truly, Jack the Ripper by Robert Bloch, which originally appeared in the July 1943 issue of Weird Tales. This video features two panel discussions recorded at the First World Fantasy Convention, held in Providence, Rhode Island (home of the late H.P. Lovecraft) in 1975. The first panel features fantasy & horror authors speaking about how they came to write fantasy and supernatural fiction. Moderated by cartoonist Gahan Wilson, authors include Joseph Payne Brennan, Robert Bloch, Frank Belknap Long and Manly Wade Wellman (speaking in that order). 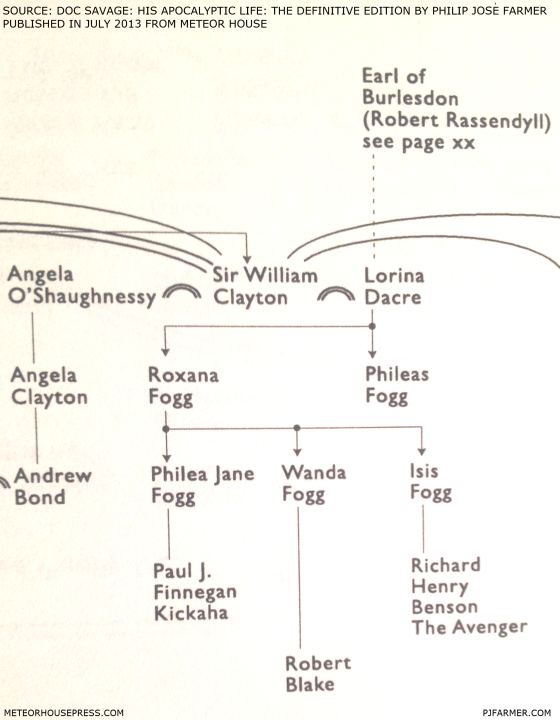 All authors on this panel were published by Arkham House. The second panel discussion is about fantasy and supernatural horror publishing. It is again moderated by artist & cartoonist Gahan Wilson, the speakers include publisher Donald A. Wollheim and author Robert Bloch. For additional background please visit James McGlothin’s article at Black Gate. Which brought these recordings to my attention.